CEO & President Sven Lindblad and executives of Lindblad Expeditions discuss plans for their forthcoming expedition cruise ship National Geographic Endurance. Drawings and artist impressions of National Geographic Endurance courtesy of Lindblad Expeditions. 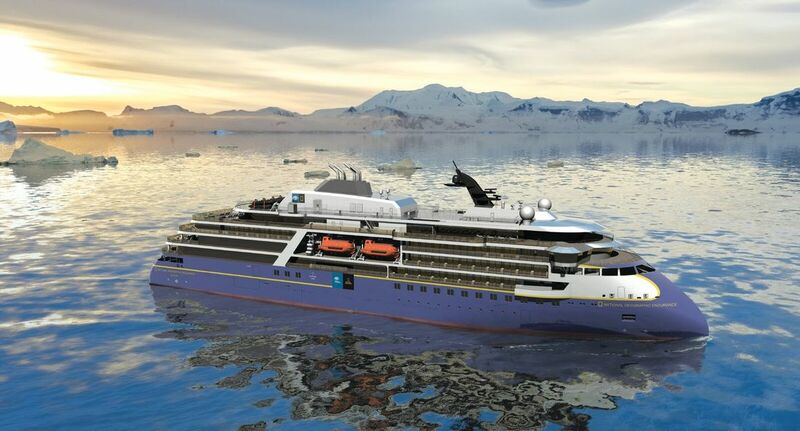 On September 27, 2018, Lindblad Expeditions-National Geographic unveiled plans for their forthcoming ship National Geographic Endurance. The 12,300 gross ton ship is being built by Norwegian shipbuilder Ulstein and is scheduled to go into service in 2020. 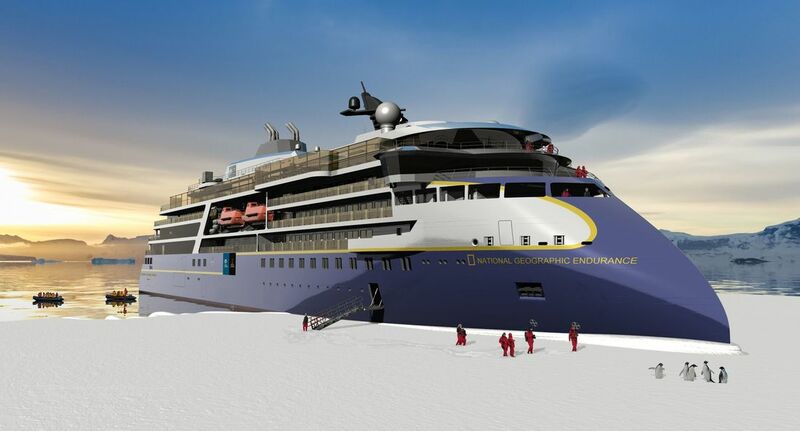 National Geographic Endurance will be an expedition ship. Indeed, her name is a tribute to polar explorer Ernest Shacleton, who took a ship named Endurance on an expedition to Antarctica in 1914. “Expedition travel is all we have ever done. It is not a sideline, it is not a new idea, it is what we have done for a very, very long time.” commented Sven Lindblad, CEO & President of Lindlad Expeditions. While Endurance will be an icebreaker, she will also be like a luxury cruise ship. The fares will be all inclusive covering such things as gratuities and drinks. The staff to guest ratio will be almost one to one. Capacity of the ship is limited to 126 guests. “We don't want to be in the world's wild spaces with too many people,” Mr. Lindblad explained. To design her interior, Lindblad Expeditions selected Partnership Designs of Hamburg, Germany, a leading designer of ship interiors whose credits include the interior design for Carnival Cruise Line's latest ships. Their designs are based on the theme “Fire and Ice,” which will be reflected in the color schemes and feel of the public areas. These areas will include the Ice Lounge where guests can gather for Recap, talks, presentations and sociability. The Den will be an intimate lounge with a fire-place on Observation Deck. In addition, there will be a spa with saunas, a yoga room and twin infinity Jacuzzis. A key part of the interior design is the 10,000 square feet of windows. “There is part of me that wants to rename the ship the 'Glass Ship' because there is a massive amount of glass. The whole philosophy of the company is to focus on the outside. We want every possible connection to the outdoors. The ship itself, we think of it as a base camp. It does not look like your traditional base camp because it is extremely, extremely comfortable,” Mr. Lindblad noted. National Geographic Endurance will be offering expeditions to places that rarely or never see passenger ships such as northeast Greenland and the Northeast Passage, which runs along the top of Europe and Asia from Norway to Alaska. The ship will spend the winter of 2020/2021 in Antarctica, going deep into ice covered waters.